A memorandum or memo, in the simplest sense, is a brief and informal message written with the intention of aiding the human memory. It is devised for a specific purpose, and to a certain audience within the same organization. In most cases, it is considered as a means of internal communication (usually between people of the same office). 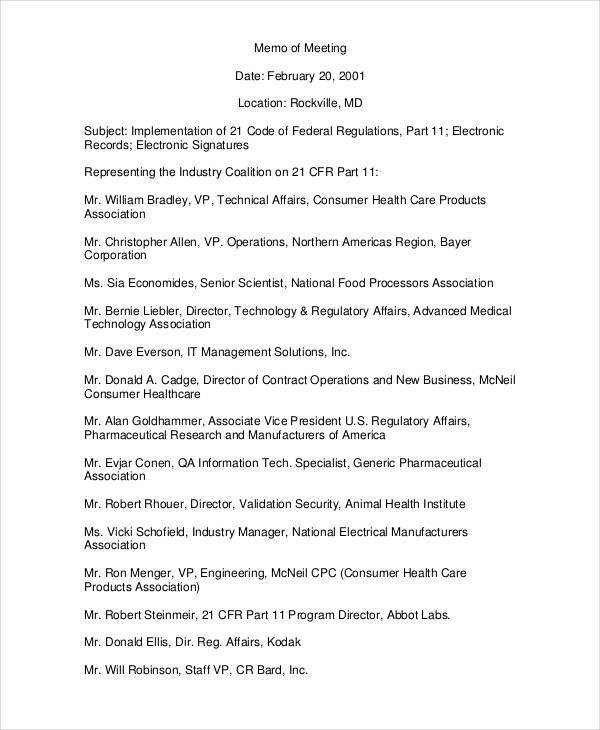 You may also see executive memo examples & samples. At times, it may also serve as a formal message intended for business or diplomatic purposes. This means, a means of external communication between clients, business partners, suppliers, etc. 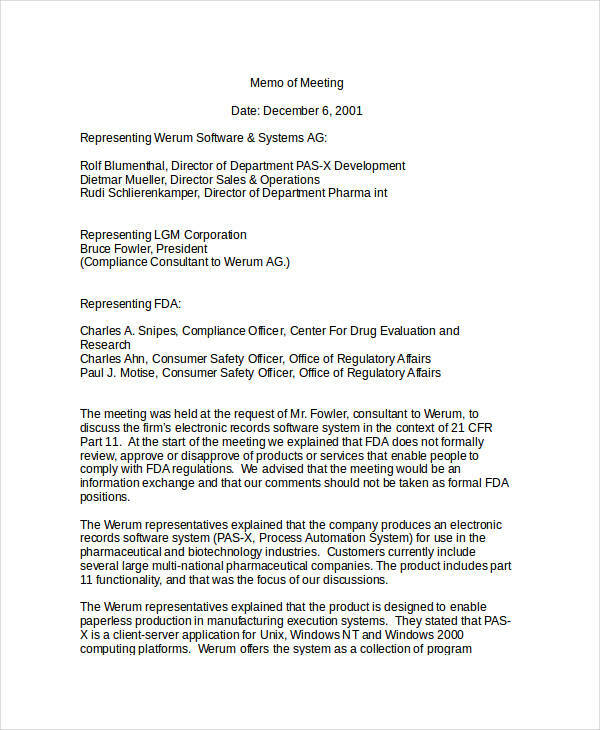 Here, we will be discussing about a meeting memo and what it is about. 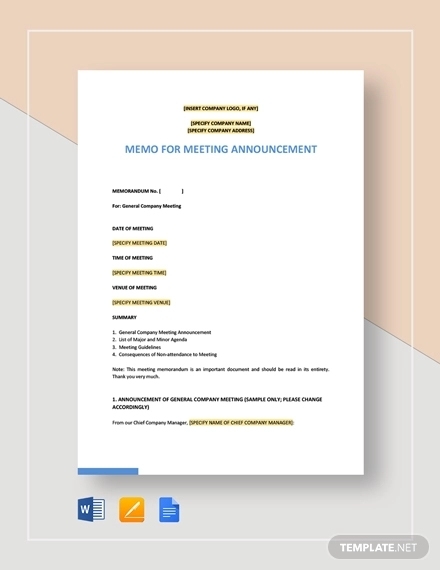 What Is a Meeting Memo? A meeting memo, is a memo which includes a written summary of a meeting, usually an upcoming meeting. 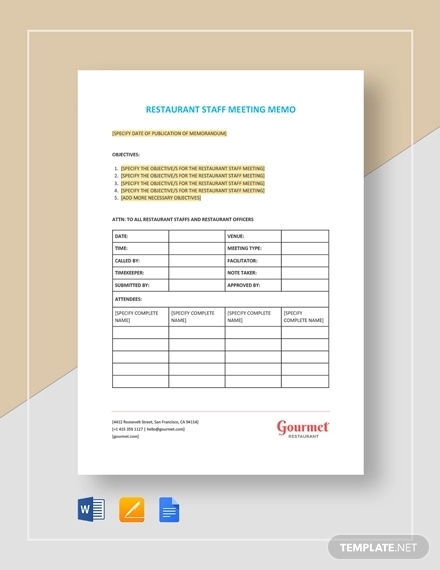 Just line an agenda, a meeting memo usually contains a few details regarding the meeting, including the date (and time), location, and matters to be discussed. It can also include the name and an position of the sender (in the organization), as well as the recipient’s name and position. 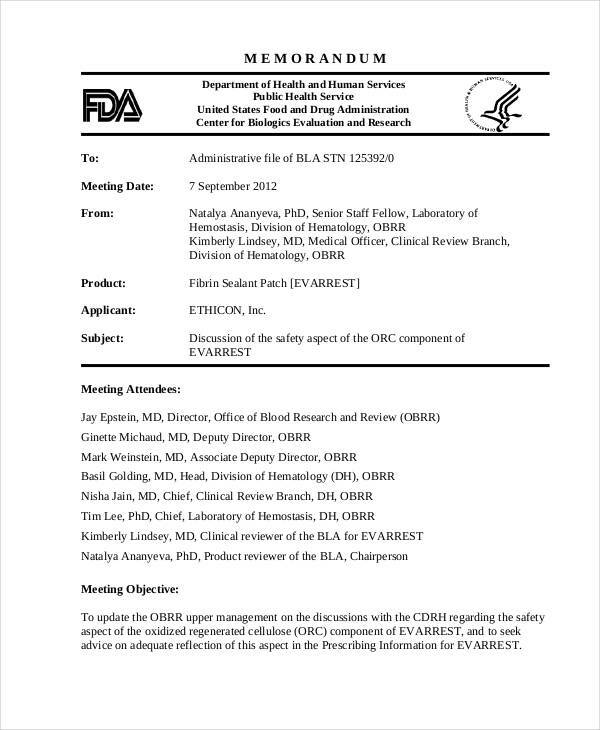 Its main purpose if to notify, or remind people that a meeting is to be held at a given time and place. 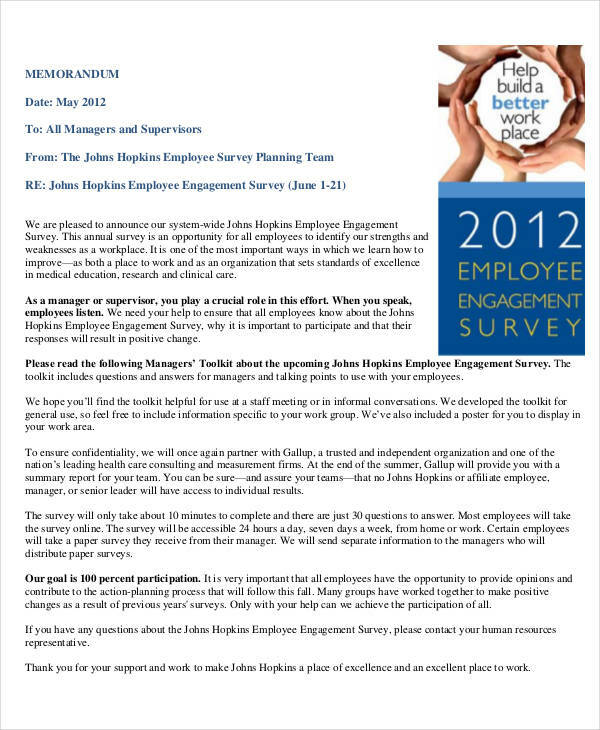 You may also see hr memo examples & samples. 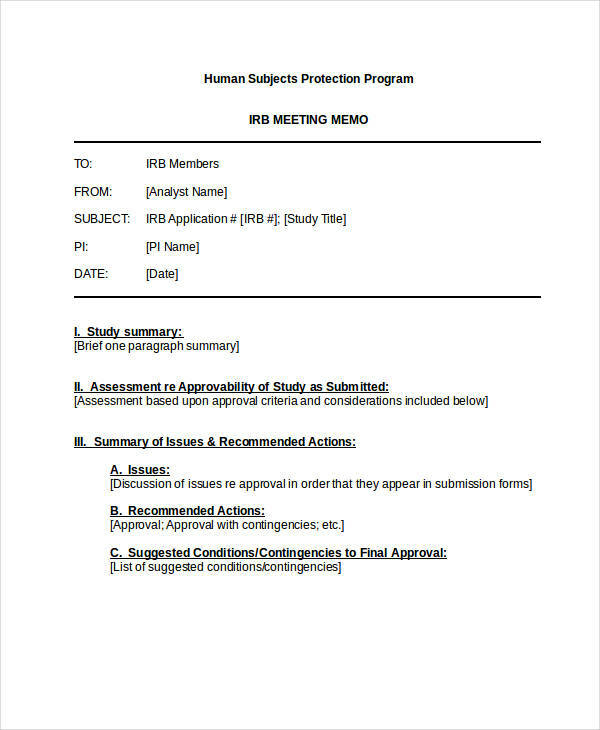 Indeed, a professional memo can be used as a notice of an upcoming meeting. However, it may also be used to serve as a notification containing the details of a previous meeting. This is why it is sometimes confused with the minutes of the meeting. 1. 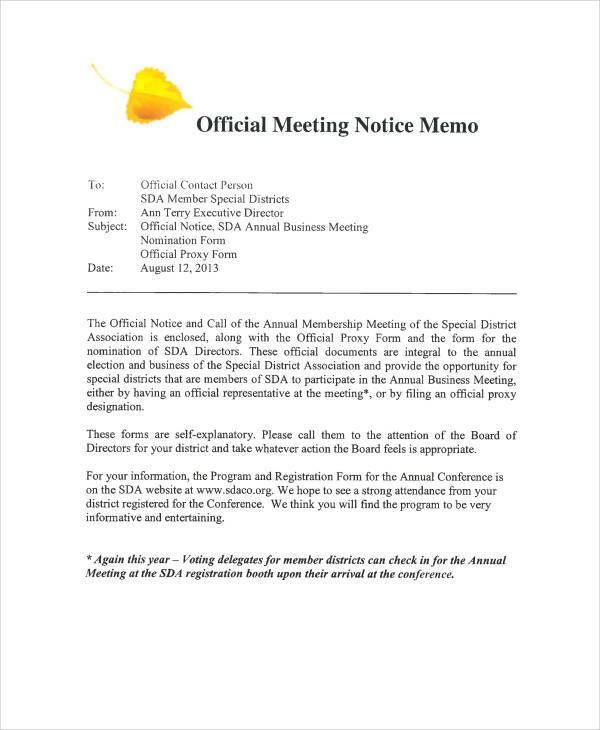 The minutes of the meetings serves as a record of the meeting, primarily containing a detailed description of the entire meeting, including the matters discussed, meeting attendance (a record of those present and absent during the meeting), specific actions taken, duration of the entire meeting as well as the discussion for each subject or matter, and other details that have taken place during the meeting, all in chronological order. 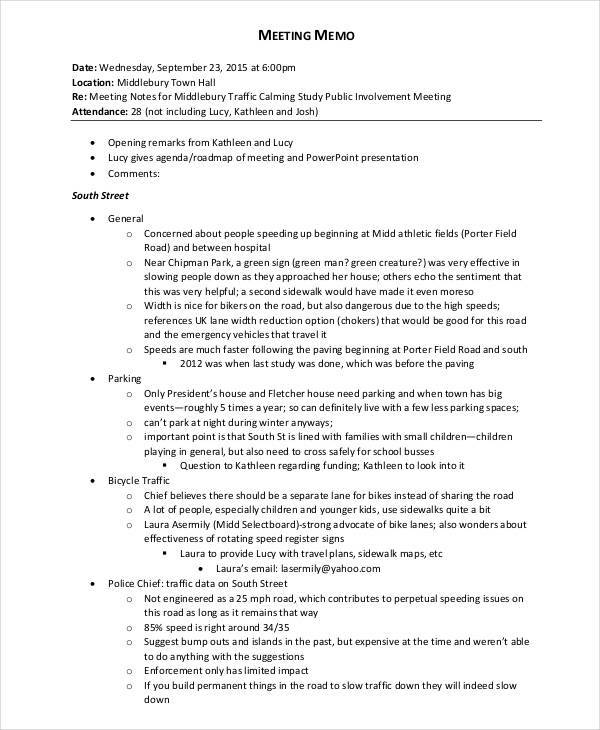 You may also see management memo examples & samples. 2. 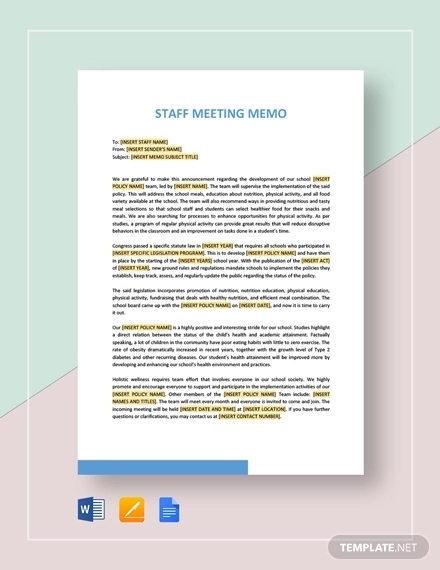 A memo also serves as a record of the meeting, typically presenting the important details of the meeting. However, it is often intended to present the meeting details to those who were absent during the meeting. In short, the minutes of the meeting serves as the official record of the meeting, which will be used for future reference of the previous meetings. 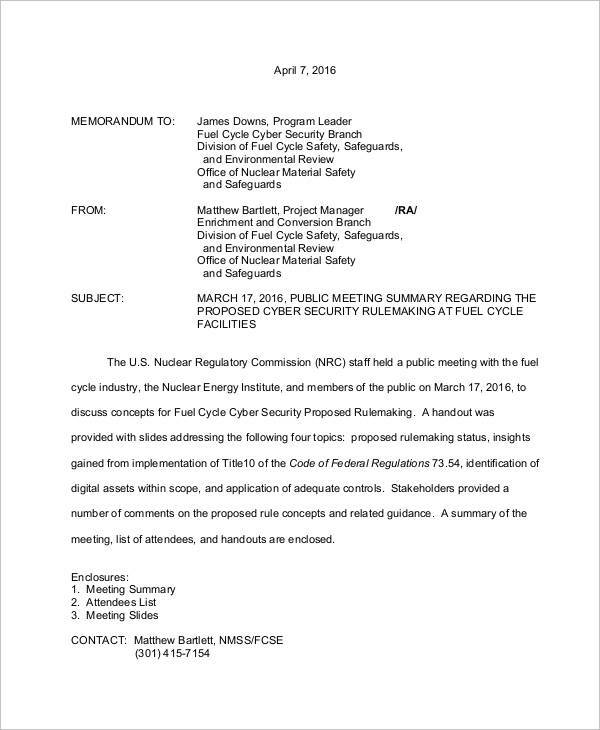 On the other hand, a memorandum contains the same details presented in the minutes of the meeting, and may or may not omit a few points upon its presentation. You may also like internal memo examples & samples. Define the purpose of writing a meeting memo. Plan the points to include in the meeting and consider the people to attend the meeting. 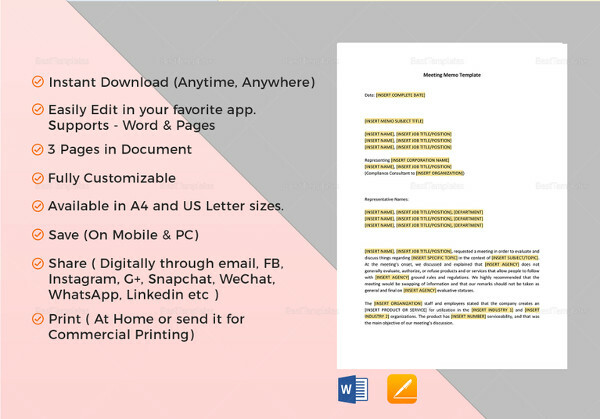 Determine the format of your formal memo. Clearly identify the main purpose or smart goal of the meeting. Provide information on the matters to be discussed in the meeting. 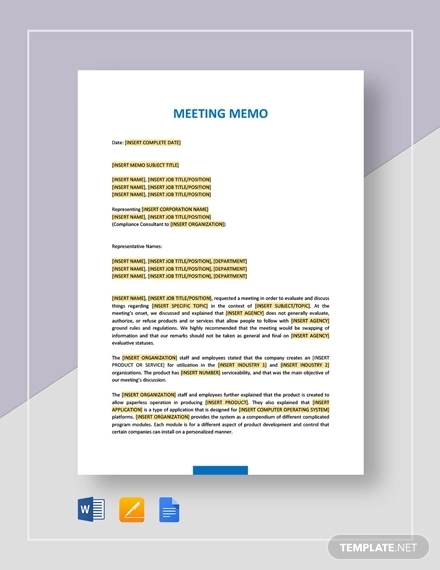 You can add other details in your memo with regards to the meeting. 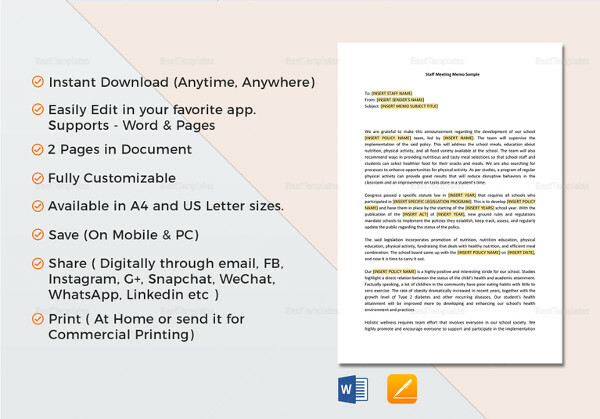 Attach a few supporting documents to your memo.